They congregate in the environments that suit them best; some prefer the dry, desert-like conditions of our forearms while others thrive in the Amazon-style humidity of our feet. Scientists at Argonne worked together to better understand bacteria and enzymes in the human gut. Pictured (left to right) are Christine Tesar, Kemin Tan, Andzej Joachimiak, Gyorgy Babnigg and Rosemarie Wilton. Though we are born without them, bacteria inhabit our body within seconds of our birth. They live in our mouths, around our eyes, in our digestive systems, under our arms and in the shoots of our hair. Most are helpful or at least harmless. The three or so pounds of bacteria living in our gut—mostly in the large intestine—help us digest all manner of food. It’s these tiny stowaways that interest Andrzej Joachimiak and his team the most, in part because they can have a tremendous impact on human health. Scientists know the bacteria inside our gut can influence our maturation, immune system development, metabolism and production of essential biocompounds. Previous research shows that a number of diseases—including cardiovascular disease, diabetes and inflammatory bowel disease—are associated with changes in our gut bacteria or microbiota. Some have been linked to obesity. Joachimiak is the director of the Structural Biology Center and the Midwest Center for Structural Genomics at the U.S. Department of Energy’s Argonne National Laboratory. He and his colleagues have recently determined the three-dimensional structure of one of these bacterial enzymes. It plays a fundamental role in human digestion by breaking down sugar polymers to simple glucose. Human cells do the same thing, but, until recently, no one expected gut bacteria to have such a large repertoire of enzymes that break down complex sugars. This is important because it could potentially help scientists and doctors to better understand the impact of gut organisms on human diseases like diabetes. There are many practical applications of this type of knowledge. Joachimiak said much of the medicine prescribed today focuses on human, rather than bacterial, cells, in part because we know relatively little about the hundreds of species of bacteria living in and on our bodies. Some medications—specifically, antibiotics and antimicrobials—do, in fact, target bacteria, but this arsenal could be greatly expanded if scientists knew more about exactly what these symbiotic companions do inside their hosts, Joachimiak said. He and his group have recently published a paper on their research in the Journal of the Federation of American Societies for Experimental Biology, with Kemin Tan, a structural biologist as lead author. Joachimiak said our ​“gut microbiome”—the colony of bacteria that live in our digestive tract—has been co-existing and evolving with us throughout human history, but only recently have scientists devoted time to understanding these tiny, unicellular organisms. 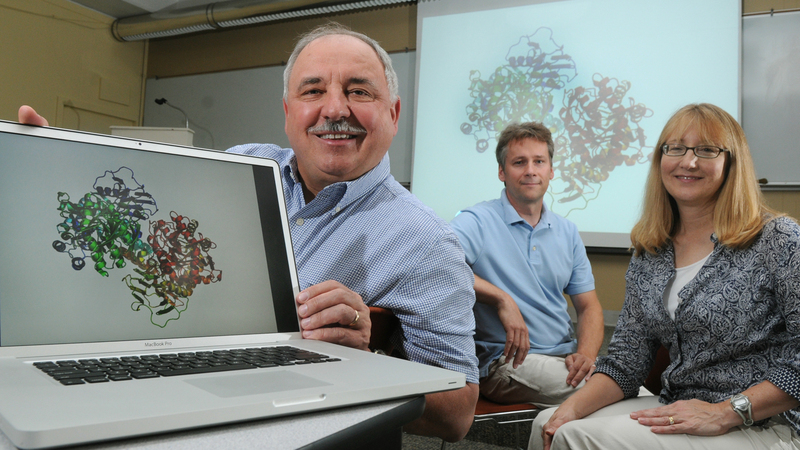 Gyorgy Babnigg, who worked with Joachimiak on this project, said that the team has determined the structure of about a dozen of these sugar-degrading enzymes, all of which play an important role in helping us with digestion. Not so for some plant material. Rosemarie Wilton, a molecular biologist at Argonne, played a crucial role in the study. She examined how these protein break apart sugar molecules. And there were others who contributed; Laura Keigher cloned genes necessary for this study, and Christine Tesar purified and crystallized the proteins used in this research. While researchers have placed increasing emphasis on this area of study in the last decade, bacterial enzymes remain a mystery, at least in part. Scientists say now is the time to focus on this type of research, especially considering that bacteria outnumber human cells by at least 10 to one.